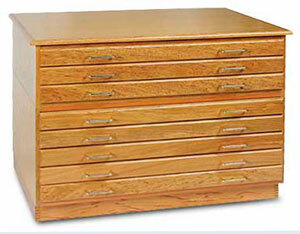 These beautiful oak flat files are great for storing and protecting your work. Stained in golden oak with a shiny finish, they fit in most any home or office setup. Choose from three-drawer, five-drawer, and eight-drawer units. You can create a ten-drawer or fifteen-drawer unit by stacking the five-drawer units up to three high. Drawer fronts are solid oak and have brass drawer pulls. The bottoms of the drawers are made of hardboard. 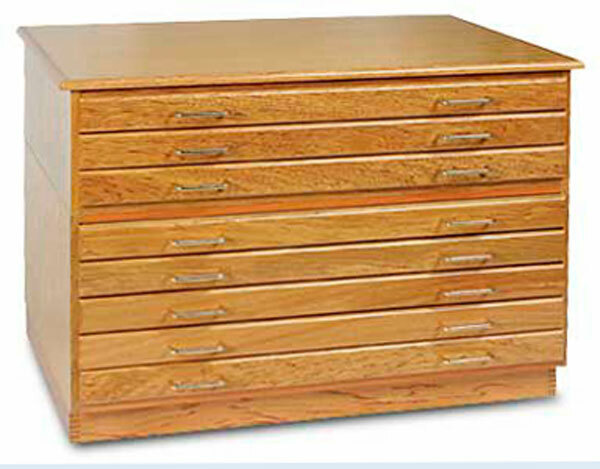 Drawers measure 36¾" W × 2¼" H × 25" D on the inside, which is large enough to hold full sheets of artist's paper up to 24" × 36". Files ship unassembled to save on freight charges and prevent shipping damages. They assemble to create a sturdy and useful piece of furniture. Note — Color variations in the wood are common. To view a PDF on How to Assemble the Richeson Flat File please click here.